First People. Ancient Civilizations. Enduring Cultures. 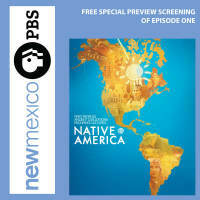 The 60-minute preview will be followed by a discussion with Gary Glassman – Executive Producer/Director- Providence Pictures, Patricia Crown – Distinguished Professor of Anthropology – UNM, Anna Roosevelt – Professor of Anthropology – University of Illinois at Chicago, and Jim Enote – CEO, Colorado Plateau Foundations. Gene Grant, host of New Mexico in Focus will moderate the panel discussion. NATIVE AMERICA explores the worked created by America’s First Peoples. The four part series reaches back 15,000 years to reveal massive cities aligned to the stars, unique systems of science and spirituality, and 100 million people connected by social networks scanning two continents.